The 360 feet per second speed puts it in the high league of crossbows that can take down big game. A wide range of accessories is supplied with your purchase, such as a scope, arrows, and a quiver. The integrated rope cocker keeps draw weight at a minimum and makes using the crossbow more convenient. You will find no noise suppressors and vibration dampening technologies already installed, so you will have to purchase these separately. 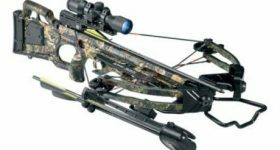 This crossbow is the winner of a Reader’s Choice award handed by the Game and Fish magazine in 2016, and everything about it will guarantee that the award was well deserved. The company thought about improving its previous model, the older-generation Turbo GT, making it lighter by half a pound, shorter by three inches, and faster by 15 feet per second. All these enhancements made a good model excellent, something that was readily appreciated by crossbow hunters who tried the new version. When combined with arrows of the proper weight, this model can achieve top speeds of 360 feet per second, which is enough to drop big game without a problem, given the 107 ft-lbs of kinetic energy it releases. This crossbow is built with durability in mind. One of the reasons why it is more expensive than other models you see around is the investment of good quality materials in its manufacturing so that you can rest assured that you are making a sound investment, should you decide to buy it. Down to the minutest details, this crossbow is made to ensure that the user will be able to enjoy it for many years to come. The safety wings, for instance, are made from reinforced nylon, and their large size also makes them more efficient at keeping your fingers safe from the string path. Weighing 6.5 pounds, this crossbow is lightweight compared to other models on the market. Bear in mind that this weight is calculated without accessories, so expect some extra bulk once you start loading your crossbow with all the needed extras. You will notice that the crossbow comes with a high-quality camo pattern that will allow you to become one with the environment while hunting in various areas. Another thing that you will like about this model is the excellent grip that feels great in your hands and gives you confidence in your skills. It must be said that the camo paint doesn’t look like it will fade away too soon, and overall, the crossbow will give you the feeling that you are holding a top of the line quality item in your hands. The narrow width is a contributing factor to the appeal of this model. At 13.5 inches in width when cocked, the crossbow will not take up a lot of room, and you will be able to handle it with ease. When you receive this crossbow, you get an entire package that contains everything you need to start hunting right away. The model comes with a 3X Pro-View 2 scope that enhances the capabilities of this model. The crisp and bright optics delivered, plus the multiple aim points, allow you to shoot at different distances without sacrificing ease of use or comfort. You will also like that the scope comes with an illuminated red/green reticle that will aid you when shooting targets in less than ideal light conditions. Besides the scope, you will get a quiver for three arrows that allows you to grab your next arrow with ease. Along with the quiver, you will also receive three arrows and a quiver bracket that can be mounted on the side of your crossbow; you can install this bracket depending on whether you are a left-handed or a right-handed shooter. Having all these extras is nice, but it is the integrated cocking mechanism that might deliver the final blow when making an impression. The ACUdraw mechanism is a rope cocker that self-retracts and makes cocking your bow easy as a breeze. The main advantage offered by this feature is that the required draw weight is halved. If you read reviews of this model, you will find many people who will tell you that this model is quiet. However, this doesn’t mean that you shouldn’t want to make it even quieter, as any sound you make while you’re stalking your prey, and especially when you prepare your shot, can scare the game away. In this case, the manufacturer didn’t include noise and vibration dampeners, or string stoppers that could work toward attenuating the sound created by shooting your arrows. This is the main drawback of this crossbow, but it can be quickly solved by purchasing such noise suppressants separately. Nonetheless, some may argue that, given the price tag attached to this crossbow package, such accessories should have been included. 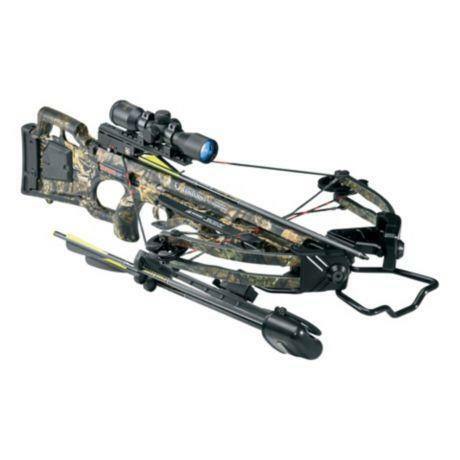 One of the first things about this crossbow you will fall in love with is the ease of handling. You will appreciate how efficiently and fast your arrows travel once released from this bow, and you will have no troubles hitting the target and enhancing your skills as a hunter. Winner of the award offered by Game and Fish as it was chosen in 2016 by the magazine’s readers, it provides the efficiency and durability expected from a model in this category. The kinetic energy, top speed, and overall construction are all reasons for getting this crossbow.